I was born, baptised and confirmed a Catholic, but I could never relate to the Church. For four straight weeks I attended Father John's 7 a.m. Mass at Saints Peter and Paul in Vancouver in addition to regular Sunday morning Mass. The truth is I knew after my first Mass that I had found my priest at long last. I was born, baptised and confirmed a Catholic and attended Roman Catholic schools until I reached college. But I could never relate to the Church. For most of my life I have hopped from church to church looking for a priest that I could connect with. With a fundamentally weak religious "training," I drifted. I attended Mass only when I felt I needed or had to, which wasn't very often at all. Well into adulthood, I felt that the congregations were just going through the motions and priests were stern and as uninterested as I was. As much as I tried, I just couldn't connect. For that, I felt an immense inner guilt and confusion. Despite that, I never lost my longing to make more tangible the faith I knew I had. That underlying faith always drew me back. Six months ago, I finally decided that I needed help. 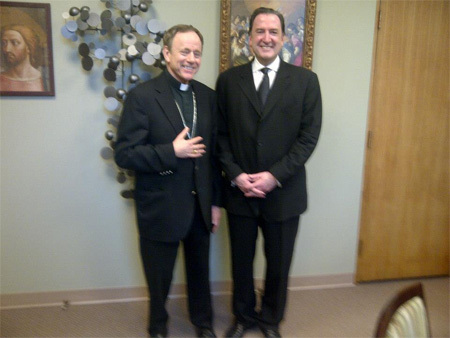 I went to see Archbishop Michael Miller, chief shepherd of Vancouver's 475,000 Catholics. Archbishop Miller holds a Doctorate in theology at the Pontifical Gregorian University and was a senior member of the Roman Curia. We talked for a couple of hours and I finally told him my problem. He gave me three names of priests I should "take for a test drive." Father John Horgan was at the very top of his list. He said, "I think he's your kind of guy." So for four straight weeks I attended Father John's 7 a.m. Mass at Saints Peter and Paul in Vancouver in addition to regular Sunday morning Mass. The truth is I knew after my first Mass that I had found my priest at long last. Father John is a graduate of Harvard and also holds four degrees from the Angelicum in Rome, including a Licentiate in Moral Theology and was ordained by Pope John Paul II. He is also teaches moral theology for the Archdiocesan Office of Religious Education. Father Horgan was a seminarian serving Papal Masses. Pope John Paul II consecrated Father John's ordination chalice himself and celebrated Mass with it in his private chapel on the eve of the ordination. The chalice was presented to Father John as an ordination gift. When I first had an extensive conversation with him, I asked Father John when he first felt the call to serve. Without any hesitation, he replied: "When I was four years old." His mother, describing the many religious statues and pictures that filled her son's room, was known to joke to family and friends that when she went into the room, she didn't know "whether to dust or genuflect." Father John had the misfortune to hear my confession. When I told him that my last confession was when I had my first one over 40 years ago, he paused and said with a chuckle: "I hope you're sitting down. Make yourself comfortable. We'll be here a while." There have been times when my faith has been severely shaken. This was particularly true against the backdrop of a strong interest in history and philosophy. Father John taught me that there's nothing irrational about faith. In fact, the life of the Christian is one based on reason, and is enlightened by faith. "We cannot disregard the rational, but faith takes us to places reason alone cannot. Intellect also comes from God." Without knowing it, Father John has been one of the greatest teacher's I have ever had. He opened my eyes to the power of prayer, the Holy Trinity, and the true beauty and meaning of the Eucharist. I am now embarked on a journey of learning and discovery. It is one that I never anticipated. Father John helped me figure out that while I have always had faith I never truly understood how to practise it. Several months ago, I told Father John that I had been searching for years for a way to connect with God. He jolted me with his reply: "Has it ever occurred to you that he has been searching for a way to connect with you, Daniel?" I now am equipped with the essential foundation that I have been missing. My path to learning will be a long one, but I am confidently on it, at last. That's what great teachers like Father John do. Sunday was his last Sunday Mass at Saints Peter and Paul. The "Boss," Archbishop Miller, has assigned him a new parish in North Vancouver. At the very end of the 9 a.m. Mass, the packed church burst into a spontaneous and prolonged round of applause. Many people had tears streaming from their eyes. They feel that they have lost a loved one. Such was the impact of Father John on those he has touched. Waiting outside the church as he usually does, he greeted me warmly. We shook hands, and I told him that he has had a profound impact on my life. I gave this great bear of a man a bear hug. He then looked at me with those sincere, intelligent, and loving eyes, and said: "You are in my prayers, Daniel." "I know I am, Father John, I can feel it. And you will always be in mine."